As more people opt for bicycles over cars to run errands, commute to work and enjoy our beautiful community, it is important for automobile drivers to watch for cyclists and understand the laws governing them. Because state law defines bicycles as vehicles, bicycles are allowed on all roads within Bay Village. Individual cities within the state cannot outlaw biking on any of their streets. In fact, the only roads where bikers cannot bike in the state of Ohio are freeways. 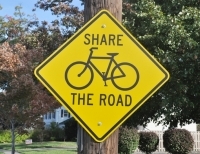 When approaching a bicycle rider on the road, he or she should be treated as a slow-moving vehicle. Drivers should allow a minimum of three feet of clearance when passing a bicycle rider, yet more space should be given when possible. State law allows automobiles to pass a bicycle rider by crossing a double yellow line only if it is safe to do so. Intersections are especially dangerous for cyclists and cars. According to NOACA, a federal agency responsible for transportation planning in our region, 70 percent of accidents in Bay Village involving both a bicycle and an automobile occur at intersections. That is one reason why state law prohibits passing of any vehicle, including bicycles, within 100 feet of an intersection. Automobile left-turn accidents involving a bicycle in intersections are common. Therefore, look for oncoming bike traffic before making a turn. Safety is not only the responsibility of automobiles. Those riding a bicycle in the street are required to know and follow all vehicular traffic laws. The following are a few. Ride with traffic, not against it. Obey all traffic signals, signs and lane markings. Use approved hand signals to notify others of your intent to turn or change lanes. Ride as far to the right as is safe, but not so close to the curb that you cannot swerve right to avoid objects in the road. Swerving left to avoid a road hazard could, unexpectedly, put you into the path of a passing vehicle, resulting in injury or death. Generally, the safe riding position within a lane is where the right tire of an automobile would travel. Furthermore, do not pass cars on the right, especially at red lights. Instead, get behind the car in front of you, make sure that you are visible to opposing traffic, ride through the intersection when the light turns green, and return to the right side of the road once you are safely through the intersection. This will lessen the likelihood of being hit by an automobile making a turn. Most of all, be visible and ride in a predictable manner. Wear bright, reflective clothing. As required by law, use a red rear light and white front light after dark. Keep the path of your bicycle as straight as possible. Riding erratically in the road makes it dangerous for faster moving vehicles to pass and can cause tension between cyclists and automobile drivers. Whether you drive an automobile, ride a bike only a few miles a year, or ride a bike thousands of miles a year, following these safety tips will make the roads safer for all users. Following these basic guidelines will also help keep Bay Village a bicycle-friendly city.